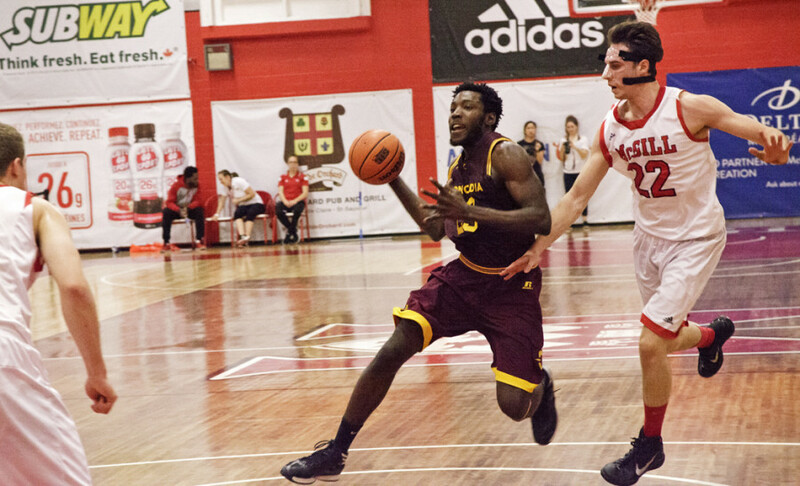 The Réseau du Sport Étudiant du Québec slate finally got underway on Thursday night for the Stingers—and they got it off to a good start with a 70-67 win over the Bishop’s Gaiters. Despite some extended periods of sloppy play, veterans like guard Ken Beaulieu and forward Schneiders Suffrard came through and helped them start the regular season in the win column. In the first half, the Stingers were just about doing everything very well. The team shot at a decent 42.2% from the field—any shot but a free throw—and got 16 points from their bench players. The only thing Concordia weren’t doing well was rebounding on defence, and the Gaiters made them pay for that. “That was a big problem tonight,” said Stingers assistant coach Nathan Grant. “That was one of our focuses for the game, to hit the board hard on both ends, and we didn’t execute that tonight at all. Despite being down by as many as nine points in the first half, the Stingers—thanks to a late second quarter scoring run—managed to cut their deficit to four points heading into halftime. In the second half, the Stingers tightened up on defense and kept the game much closer than it had been in the first half. Concordia capitalized on second chance opportunities, and even made four out of nine three-point attempts – compared to one for eight in the first half. With the help they got from their three-point shooting, the Stingers were able to do just that; play inside and outside. Along with their good half shooting from long range, they were also able to outscore the Gaiters from inside the paint, 42-40. With just a little under four minutes left to play, freshman guard Nicholas Noble knocked down a three-point shot from the corner of the court to put the Stingers up 63-60—a lead they wouldn’t relinquish. The win improves the Stingers to 1-0 in league play, with a trip to Quebec City to play the Laval Rouge et Or coming up on Sunday. It was a close win, but one that gave the Stingers a pretty clear outline of what needs to be improved on.